"Here today, up and off to somewhere else tomorrow! The whole world before you, and a horizon that's always changing! That quote sounds like our RV lifestyle, doesn't it? I need to read that children's tale again . . . This entry ties up some loose ends about a variety of other things we did yesterday and today, our last full day in Fairbanks -- and in Alaska. I can't believe this summer went so fast!!! 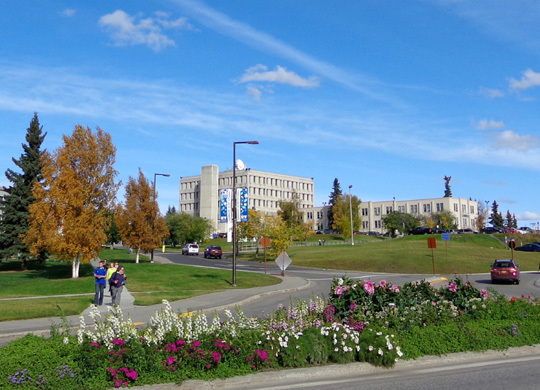 After I hiked with Cody at Creamer's Field yesterday afternoon I continued west on College Ave. through the southern part of the University of Alaska/Fairbanks (UAF) campus to the botanical garden. 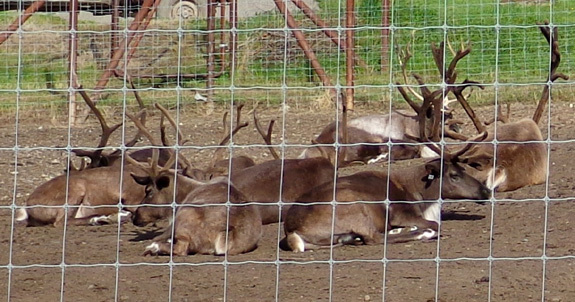 Domesticated caribou are called reindeer in Alaska. I got a few pictures of them from the truck, too. 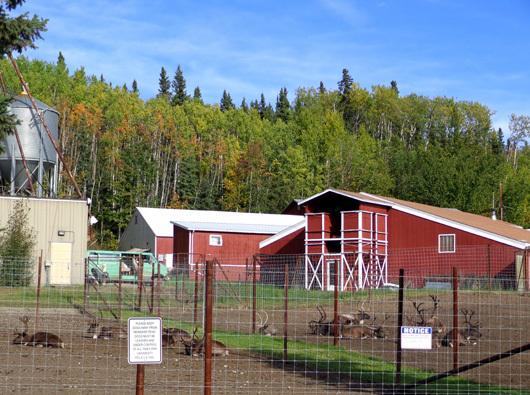 I didn�t find the large animal area with musk oxen at UAF. 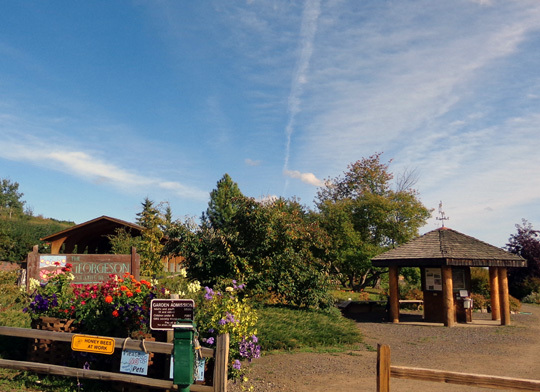 Two retirees I talked with at Creamer�s Field verified that area is closed for the season but said they could walk along the fences to see the animals. Jim saw a sign for it on the other side of campus but didn�t go back to it. We'll have to hunt for it another time. Looking at the city map, I decided to turn on Farmer�s Loop Rd. and wind around the north side of town to see what was there. 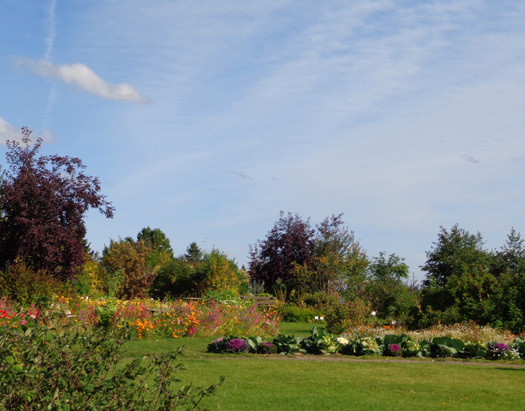 Silly me � I thought it would be through an agricultural area but it was mostly treed or businesses/residential areas. I noticed the separate bike path along the road and planned to mention it to Jim � not realizing he�d already found it! 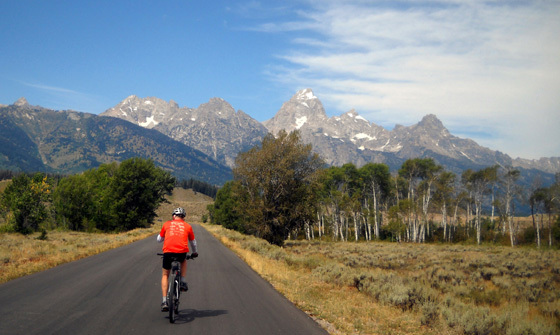 A cyclist rides next to Farmer's Loop Rd. near campus; farther east there is a separate bike path. We didn�t see each other on the road, though. Jim was done with that section before I got there. Jim left the campground after I called him from Creamer�s Field. He rode his bike for 22+ miles, doing almost the same loop as I did in the truck. 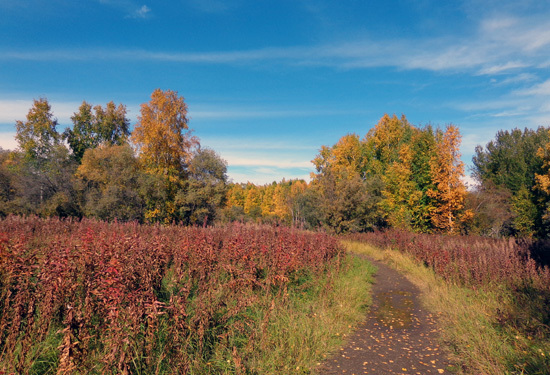 He rode the bike path along the Chena River from Ft. Wainwright to the visitor center. 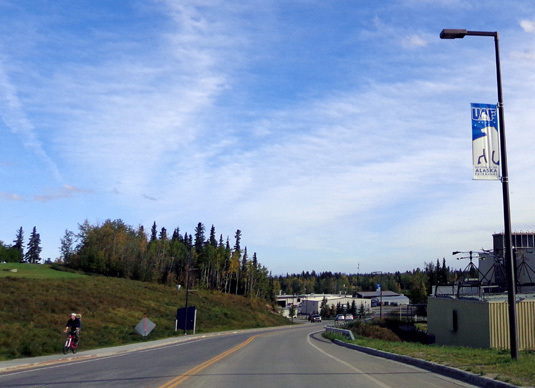 He turned around at the Cushman Bridge (next to the Yukon Quest HQ) because of construction. 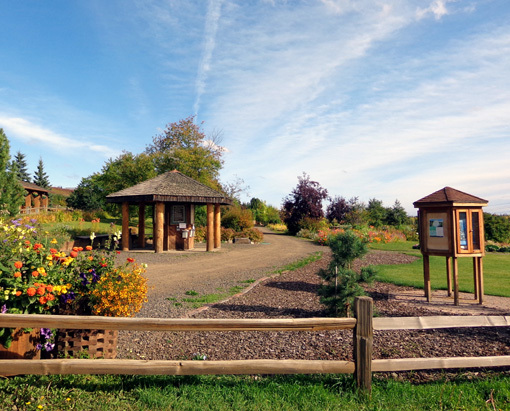 A lot of fireweeds were blooming in this area during the summer; the flowers are gone now. After watching the birds for a while he rode further west on College, then rode the long Farmer�s Loop Rd. to Steese and back down to the post. Most of these roads had either a separate bike path or sidewalk where bikes are allowed. We both got back to the camper yesterday about 4 PM and had fun comparing notes. 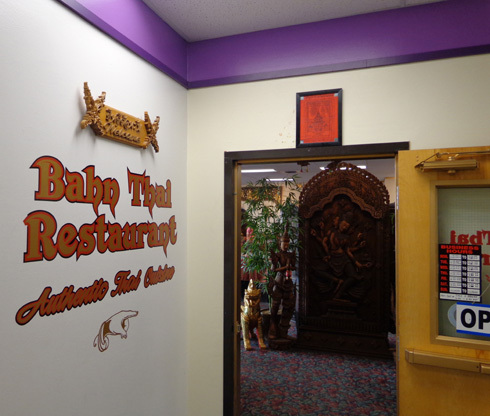 One day we had a good meal at Bahn�s Thai restaurant on 3rd Ave. The lunch portions were large enough for each of us to take half home for another meal. 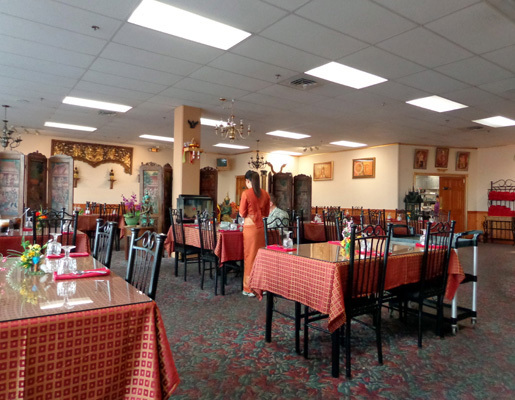 Fairbanks is surprisingly full of Thai restaurants, considering its size (about 32,000 residents plus thousands of summer visitors). We had read about two other Thai restaurants in town and chose that one. Thai Kitchen has another name now and doesn�t look all that great from the outside. Lemongrass is on the other side of town. While riding on College Ave. in the afternoon I saw two other little Thai restaurants, one near Sam�s Club and one near UAF. 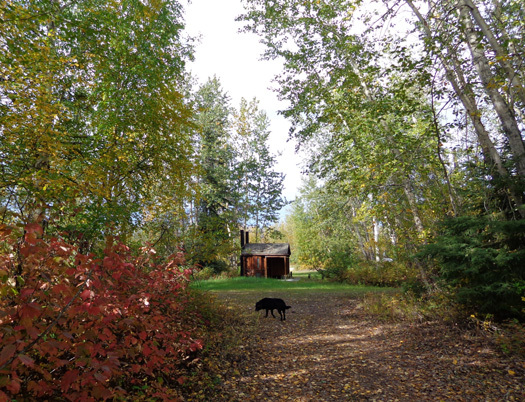 We've been following weather reports very closely the last couple of weeks, trying to eke out as much time in Alaska as we can -- without getting stuck in wintry conditions between here and the Lower 48 states. And we thought the prediction for 70 MPH winds at Denali National Park this week was bad! Note the amateur meteorologist's report in that article that he clocked the wind at 131 MPH Tuesday night at the Glen Alps parking lot. That's a popular trailhead for the hillside system and where we parked when we climbed up Flattop Mountain. I wouldn�t want to have been up there or a few miles farther north on Rendezvous Ridge during that storm!! 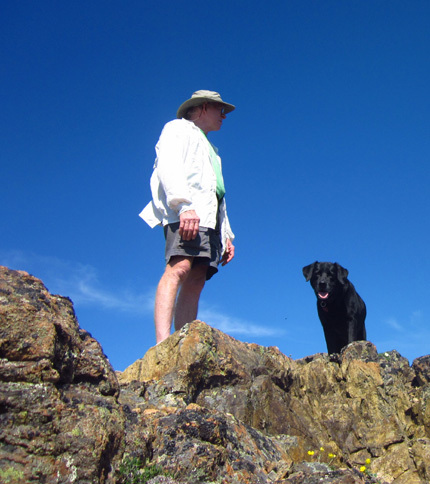 Jim and Cody on the summit of Flattop Mtn. on June 22 -- perfect weather then! Here�s another article I found this morning about snow temporarily closing part of the road through Denali National Park: http://www.alaskadispatch.com/article/wet-autumn-snowfall-arrives-denali-national-park-closing-road I just went through that section from Toklat to Eielson a week ago! I showed photos of snow that fell when we were at the park soon after that but it didn't force the road to be closed anywhere. I noted at the end of the article the comment from the park's public affairs publicist that late August and early September this year were damper and colder than usual. That's a big reason we left for Fairbanks a few days ago -- that and the 70 MPH wind prediction. This whole summer was colder and wetter than usual in the parts of Alaska we visited. You know what? We had a fantastic time anyway. We'll be glad when we can get the camper dried out, though. 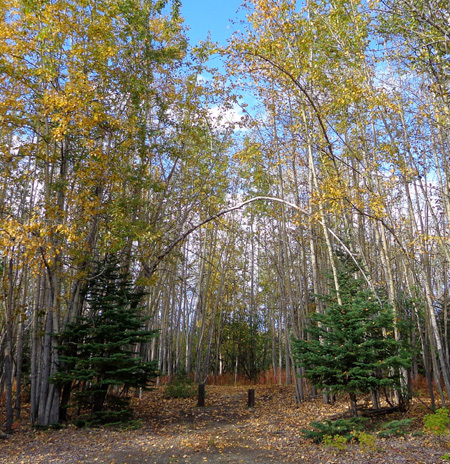 The weather is still good here in Fairbanks. This morning was 49 F. and sunny when we got up, became overcast until mid-afternoon, then got sunny again. 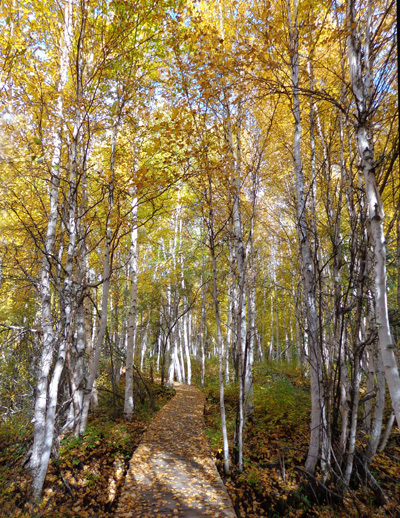 The average temps in Fairbanks this time of year are about 40 F. at night and 60 F. during the day. It got up to about 60 today. We really aren't all that far from the winter madness in Anchorage and Denali so we've begun our preparations for the long journey back to Montana and eventually to our house in Virginia. 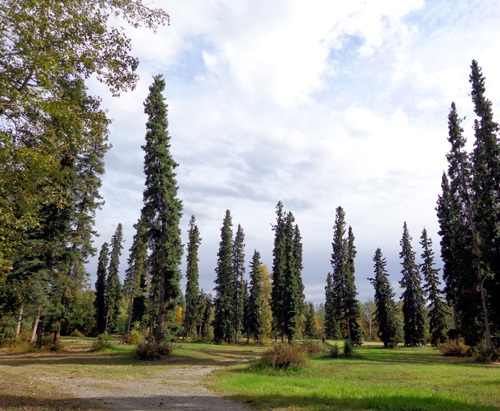 We plan to leave Fairbanks tomorrow morning -- Thursday -- and follow the Alaska Highway part or all of the way back. We're considering an alternate route that would take us through Banff and Jasper national parks in British Columbia. Cody walks through Glass Park at Fort Wainwright this afternoon. We have a list of things that need to be done every time we move the camper to another location. The list is even longer when we embark on a trip as long as the one to get us to Great Falls, Montana, our next major destination. Yesterday and today Jim has focused on vehicle and RV maintenance-related things like checking the tire pressures and adding air where necessary; putting the tire pressure monitors back on the camper tires; filling the propane tanks (we'll be doing more boon-docking while in transit); filling the truck fuel tank; checking the other truck fluids, belts, brakes, etc. ; putting some fresh water in the camper; and other items to ensure our safety and comfort on the road. Today we also did laundry at the nearby Outdoor Rec. building, gave Cody a bath, got our maps and other travel information in order for the various routes through Canada, called to make some medical appointments when we're back in Roanoke, and stocked up on groceries and supplies at Walmart, Sam�s Club, and Home Depot. For various reasons we're trying to minimize the need to purchase very much as we travel through Canada. We also don't want to use our cell phones unless there is an emergency -- it's too expensive. Although both Walmart and Sam's in Fairbanks are large stores neither had everything we wanted. There were a lot of empty spaces on the shelves and some of the produce at both places was poor quality. 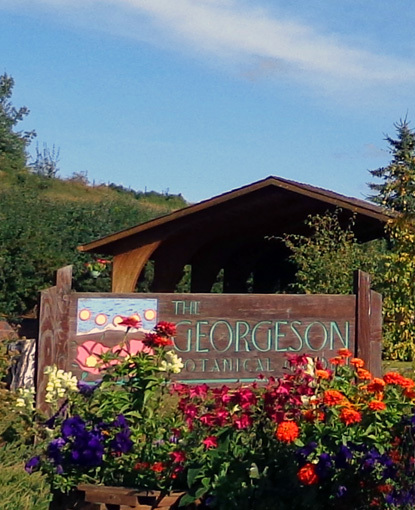 That�s pretty much the story of perishables in Alaska, even in Anchorage. Smaller cities and towns are worse. We saw a PBS show on TV this morning that featured the Blazer family's large farmers' markets in the Atlanta, GA area. The stores appear much the same as they did when I frequented them in the 1980s-90s. All I can do is yearn for that type of selection again. It�s hard to find even in many places we travel in the Lower 48, let alone in Alaska or along the Alaska Hwy. through Canada. Jim got diesel on post today for $4.05/gallon after discovering that Sam�s Club went from $4.04/gallon yesterday to $4.19 today. We thought it�d go down after Labor Day, not up. He topped off the truck tank and filled a 5-gallon spare tank with diesel for our drive through Canada. If we go on the Cassiar Hwy. 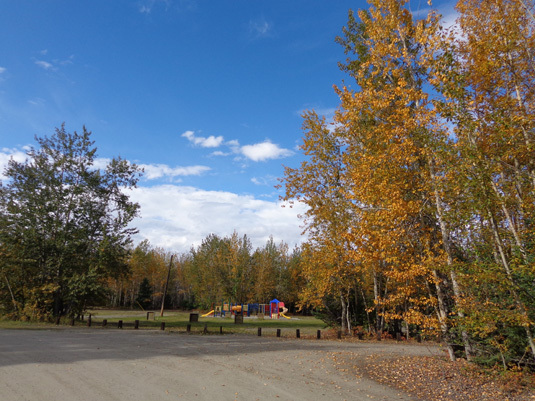 through part of British Columbia we�ll have fewer places to fill �er up than we did on the Alaska Hwy. He also got gasoline in two smaller spare tanks for the generator. Before supper I took Cody for a walk through Glass Park. The photos in this section are from today's walk. Jim took a nine-mile bike ride on post while I was hiking. 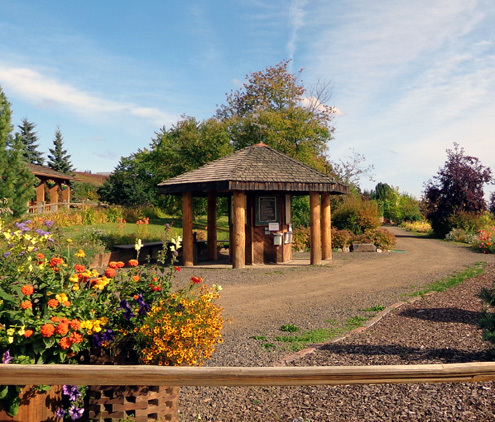 We had considered visiting Pioneer Park and the UAF Large Animal Station this afternoon but got busy with other things. We plan to spend more time here on our next trip to Alaska. May as well leave something to see the next time, eh?